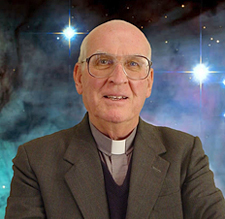 George Coyne is a former director of the Vatican Observatory and a Jesuit priest who was involved in the search for exoplanets. Concerning the effect on Christian doctrine of the possibility of alien life, Coyne has expressed the opinion that salvation does not require God's incarnation. His belief is that if alien beings have sinned, then God is free to chose to save them in some manner other than by becoming incarnate in alien flesh.